On the set of a movie about a disfigured man who falls in love with a blind woman, the beautiful lead actress contemplates the treatment on her co-stars, and whether or not the movie they are making is exploitation or art. A movie within a movie while other people shoot their own film on the side...that's just so meta. 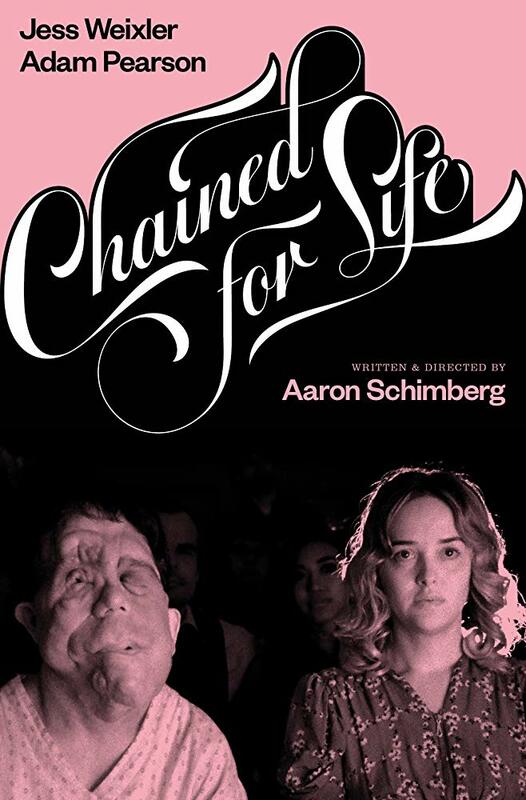 "Chained for Life" is written and directed by Aaron Schimberg, who has one other feature credit in the little-known film "Go Down Death." 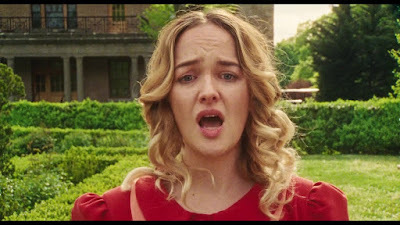 Mabel (Jess Weixler) is a beautiful able-bodied actress whose latest role has her playing a blind woman in a medical facility populated by those who have physical differences. Herr Director (Charlie Korsmo), German director extraordinaire, is helming the project in his American debut, but still has a European sensibility when it comes to his story. Mabel's character is meant to fall in love with a disfigured man who is also staying in the hospital to hopefully correct his condition. Herr Director, however, has cast people with actual physical differences and disabilities instead of using effects or prosthetics. The leading man is named Rosenthal (Adam Pearson), who has neurofibromatosis, which makes him look different than the average person. Reporters, extras, and even Mabel herself question whether or not their project is art or exploitation. Like the movie within the movie, and much like Herr Director, Aaron Schimberg has decided to cast people with actual medical conditions and/or that have unique physical features to star in his drama. It seems Schimberg wants to create a commentary about the portrayal of those with disabilities in an industry so obsessed with beauty, where one's physical appearance is integral to their success because they are so much more attractive than the rest of us ordinary peons. The question posed is, can people make movies starring actual disabled people without being exploitative and/or doing harm? The movie they are shooting in "Chained for Life" is clearly exploitative, though Herr Director would argue otherwise. It's all about secret backroom experimental surgeries on people with disfigurements who want to be "normal." Schimberg makes homages verbally and visually to movies like "Freaks." By bringing this point up time and time again in different ways, Schimberg has devised a darkly satirical but smart examination about disability and representation in an industry that has been known for anything but. Leading lady Mabel and the other actors with more traditional Hollywood-type appearances are all delicately shuttled back and forth from their locations via limousines. They stay in a hotel entirely separate from the other extras. Those individuals who have been cast for their physical differences stay in a dorm-type setting at the filming location on hospital grounds. They are herded like cattle and piled onto one single bus to be taken to and from the set. Schimberg shows how people like Rosenthal and his co-stars are continually cast as monsters and mutants or are cast specifically for fantasy films. Mabel must learn to check her privilege and preconceived notions throughout her time on the shoot. As for the narrative, the story is constantly transitioning from reality to movie to dream sequence and back again. Scenes that appear as if they are happening in real life are actually scripted, and vice versa, as the lines are blurred between fiction and real time. Because of this, it doesn't fall neatly into a traditional three-act story, which may put some viewers off. Schimberg is more focused on presenting his message and allowing the audience to get to know the characters who have been treated badly, judged, omitted, and wronged their entire lives without much thought or care from other able-bodied Hollywood clones. We wound up enjoying "Chained for Life." It presents some cleverly intriguing ideas in a unique way.